Being able to dance and dodge my way out of attending the Consumer Electronics Show in Las Vegas every January is one of the most important acts of self-care I commit to all year long. While it's always nice to catch up with colleagues at CES, the crush of human misery, drunk assclowns looking to cheat on their partner while they're off the leash in Vegas, and the multiple viruses that make the rounds each year at the event are a few of my least favorite things. This year, however, I almost regret turning down the opportunity to eat at Toby Keith's I Love This Bar & Grill every day for a week in between appointments and trips to the Las Vegas Convention Center: LG Electronics is said to be unveiling a fancy new home beer-brewing kit. 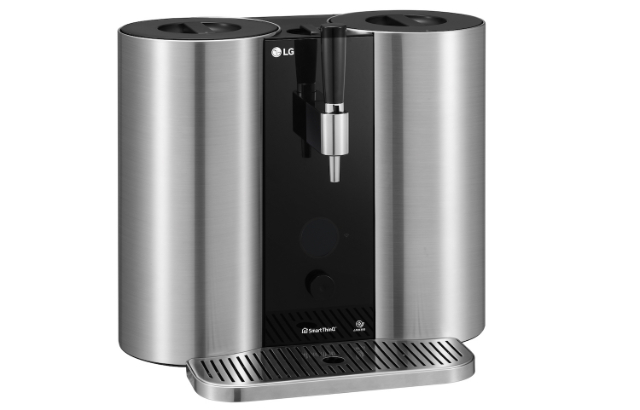 Similar to other home brewing systems, the HomeBrew uses capsules that contain everything you need—malt, yeast, hops, and flavoring—which you insert into the machine, add water, and press a button.The machine then sets the correct brewing temperature and time, and in about two weeks, will produce up to 10.5 pints (1.3 gallons) of beer.At launch, five packets will be available: American IPA, American Pale Ale, English Stout, a Belgian Witbier and a Czech Pilsner. The HomeBrew also has a self-sanitizing process, to ensure that your batch of beer isn't skunked. An app will also let you monitor the progress of the brew. It takes a lot of the guesswork out of making beer at home.